MHI :: PASADENA :: STAFF :: Katherine Revoredo, M.D. Dr. Revoredo is a board certified psychiatrist. She completed her undergraduate degree in Biological Psychology at the University of California, Los Angeles (UCLA). 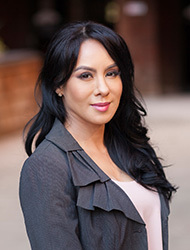 Dr. Revoredo also received her medical degree at the University of California, Los Angeles (UCLA) and trained in the adult psychiatry residency program at Cedars Sinai Medical Center in Beverly Hills, CA. She went on to receive her training at the UCLA child and adolescent fellowship where she was also chosen to serve as chief fellow during her last year of training. Dr. Revoredo has been recognized for her leadership skills and community work. She was honored with the Latino Medical Student Association Community Leadership Award in 2006, the Rebecca Lee Leadership Award in 2008, and more recently the prestigious Gertrude Rogers Greenblatt Award in 2013. She is an active member of American Psychiatric Association (APA) and the American Academy of Child and Adolescent Psychiatrists (AACAP).